Hey everyone! I’m so glad I’m able to get this post up in time for Easter! After getting hit with the flu I’m a bit behind on my to-do list. I was able to get out, sans toddler, to get the rest of her Easter loot, then restock our kitchen cabinets. If you looked inside a few of them you’d think we’d gone without food for several days! I still have yet to purchase dress shoes, sign the tot up for swim lessons, and clean up our yard. And now that the ceiling in my old bedroom at my dad’s house had finally been repaired, it’s time to clean up the outside a little and as well as the inside and get it ready to put it on the market! See what happens after being down for several days?? Oh well, but thankfully I’m healthy again and I can get back into tackling all this stuff! But anyway, I want to share with you a really cool dessert for the upcoming holiday. 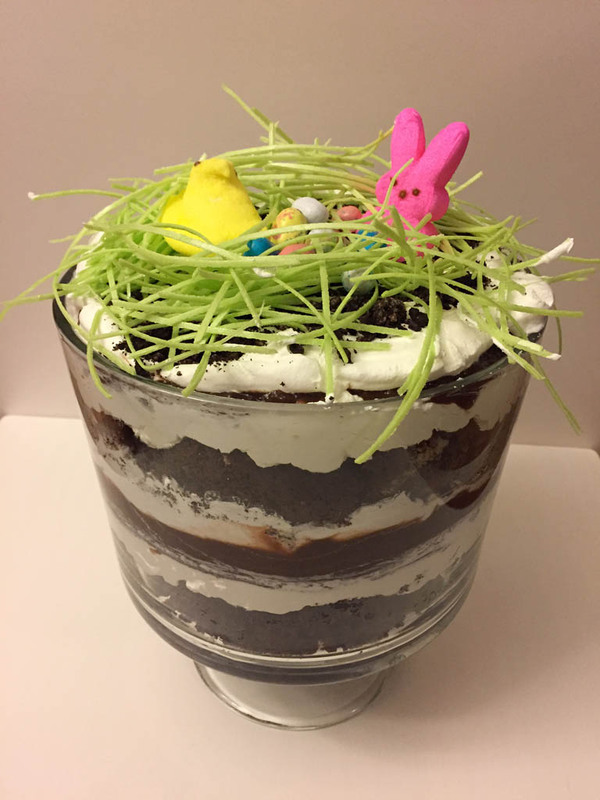 I took the dirt recipe, added devil’s food cake, and topped it off with edible grass, robin’s eggs, and a marshmallow peep and bunny. I never used edible grass before, but it tastes like a shredded ice cream cone. The key to getting all those layers into the trifle bowl is to be sure you press down the cake pieces, and to fill up every bit of space to prevent the layers from oozing through the cake layers. *If you’re unable to find edible grass locally you can order it here. • In a large mixer bowl, combine the devil’s food cake mix, water, oil, and eggs; mix well for a couple minutes. 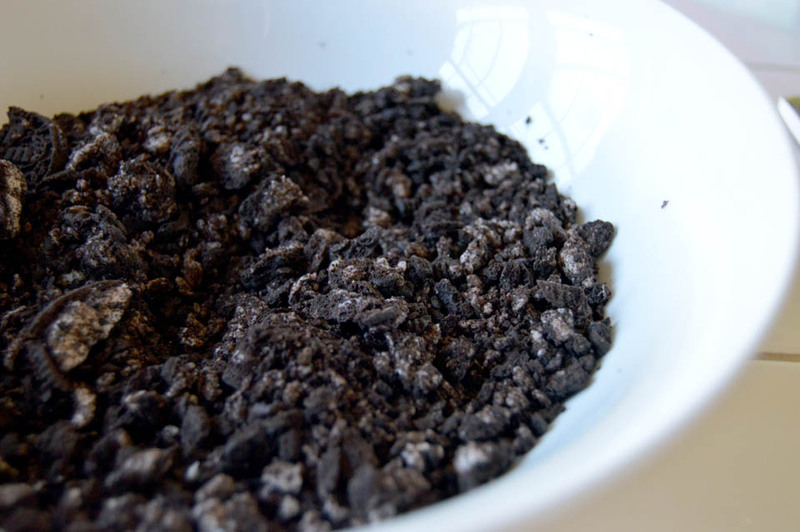 • Fold in half of the crushed cookies until just mixed in. • Divide batter up into 2 8-inch round cake pans and bake for about 30 minutes, until toothpick inserted in center comes out clean. Wait about 10-15 minutes to invert cakes onto wire racks; allow to cool completely. • Once cakes are cooled, begin the rest of the recipe. In a medium bowl, mix together 1 container of whipped topping and cream cheese until smooth; set aside. • In a large bowl, combine both vanilla and chocolate instant puddings and milk; stir until it just begins to thicken; set aside. • In a trifle bowl, begin your layers with the cake. Tear pieces of cake and place it on the bottom of the bowl, filling up every bit of space; press gently. • For the next layer, take half of the cream cheese mixture and spread on top of cake. • For the next layer, pour half of the pudding mix on top of the cream cheese mix. • For the next layer, take the other container of whipped topping and spread half of it on top of the pudding mix. Sprinkle a little bit of crushed cookies on top. • Start layers again with the cake, then cream cheese mix, pudding mix, whipped topping, and crushed cookies. While assembling I had to judge whether to use all of the rest of each layer or not, depends on how much space is left. • For garnish, cut small pieces of edible grass and spread on top of dessert. Leave a little room in the center. Add robin’s eggs in the center to create a bird’s nest. 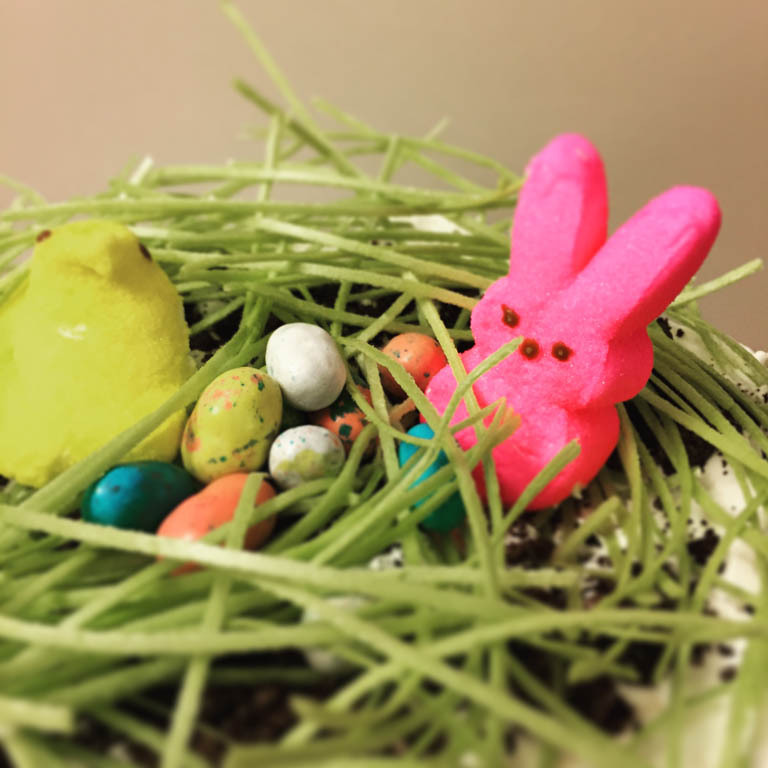 Then for the finishing touches, add a marshmallow peep and a bunny.